We are a leading Manufacturer of circular chart recorder, circular chart recorders, temperature recorder, thermograph circular chart recorder, humidity recorder and industrial circular chart recorders from Vadodara, India. 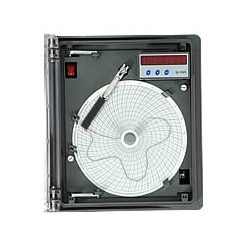 Our organization is instrumental in providing a comprehensive range of Industrial Circular Chart Recorder. The recorder offered by us is designed by using superior quality components and advanced technology in sync with industry norms. The pen and chart movement in our recorders are driven by stepper motors, provided recorder is widely acclaimed in the market for its durability and sturdiness. Moreover, this recorder is available in different designs and specifications. 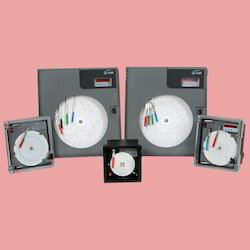 With a far sighted vision, a keen perception of the market trends, and a strong commitment to customer satisfaction, we are engaged in offering quality assured Circular Chart Recorders that ably record the variation in temperature and pressure in any industry. The offered recorders are manufactured using high grade components and advanced technology in adherence with industry norms. Keeping in mind varied demands of our clients, we offer these recorders in different sizes and designs at market leading price. 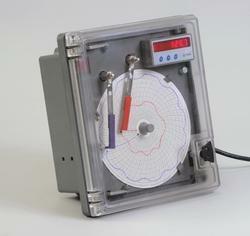 Our company has relentlessly pursued excellence in its endeavor by providing premium quality Temperature Recorder. Provided recorder is designed by utilizing premium quality components and sophisticated technology in adherence with industry norms. Used for continuous recording of one to two process variable on 10 circular chart, offered recorder is checked against different quality parameters so as to ensure its quality. Moreover, clients can avail this recorder from us at nominal prices. 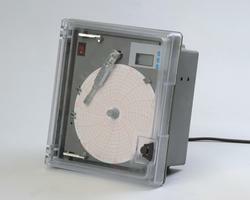 Our firm specializes in providing our prestigious clients with a quality array of Thermograph Circular Chart Recorder. Used to record the temperature, pressure and flow of various instruments, offered chart recorder is manufactured using the best quality components and innovative technology in adherence with industry standards. Our provided chart recorder is tested on different parameters under the vigilance of our skilled professionals. Keeping in mind the varied demands of our clients, we provide this chart recorder in diversified sizes and shapes. The pen and chart movement in our recorders are driven by stepper motors, which further enhances the reliability by removing the need for any potentiometric or mechanical feedback system. With a software based mechanical calibration for pen alignment, our recorders are user-friendly, letting you perform mechanical and electronic calibration from the front panel keyboard itself. Our Circular Chart Recorders are available in an array of versions and options. Based on your exact requirement, we can offer you a customized solution. It comes upto 4 pens. Chart size can be 4", 6" and 11". Our Circular Chart Recorders are available in an array of versions and options. Based on your exact requirement, we can offer you a customized solution. 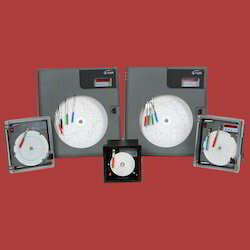 G-TEK Circular Chart Recorders are rugged and reliable in performance. With a microprocessor based design, you are assured of greater flexibility, convenience and precision. The pen and chart movement in our recorders are driven by stepper motors, which further enhances the reliability by removing the need for any potentiometric or mechanical feedback system. With a software based mechanical calibration for pen alignment, our recorders are user-friendly, letting you perform mechanical and electronic calibration from the front panel keyboard itself. In CR-2010 series Circular chart recorders, we also offer Inkless recorders. Use of the thermal paper and a thermal stylus, eliminates the need of regular felt tip pen for marking. It enhances the recording capabilities as drying up of pen is totally eliminated ensuring guaranteed recording of the parameter. The intensity of the heat with which it marks on paper is controlled by a well regulated power supply ensuring the long life of heating element. The heating element is easily replaceable type. The material used for heating element is Nickel – Chromium alloy. Also available is Battery Back-up (with 12V-7Ah Lead Acid maintenance free battery it is capable of giving minimum of 36hrs of un-interruptible usage even after power failure). It also charges battery automatically when power comes back, Over charging of battery and over discharge of battery are taken care of in the circuit. Looking for Circular Chart Recorders ?